Caley is our therapy nurse, responsible for managing our hygienists and therapists. It’s a busy role that sees her perform a range of procedures including simple hygiene maintenance, fissure sealants for children and adults, simple fillings, extractions and root canals for children. Caley runs our hygiene spa, ensuring that all the surgeries are well maintained and that our clinicians have chairside support where necessary. 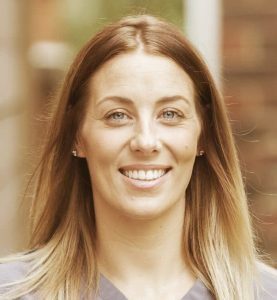 Her dental and medical career began in 2003 when she worked at St Peter’s Hospital in Chertsey and she has experience in oral surgery as well as general, cosmetic and implant dentistry. She has a national certificate in dental nursing and in oral health education, and she is currently studying for a management certificate. Caley is a passionate advocate of oral health and makes sure all her patients understand her work and feel comfortable and relaxed. When Caley is not working she enjoys fast cars, days out and holidays with good food and company, and she likes to spend time with her family and relax at home in her onesie.